One rainy Thursday, Molly the Dog and I set out for Bowling Green, Kentucky – “Kaintuck,” as dubbed by the original settlers from Appalachia. The drive, punctuated with several ferocious, zero-visibility downpours, found us going ten miles-per-hour through 70-mph stretches of Interstate 40, and gripping the steering wheel in terror each time we passed a semi, its tires spraying a momentary, blinding geyser across the windshield. 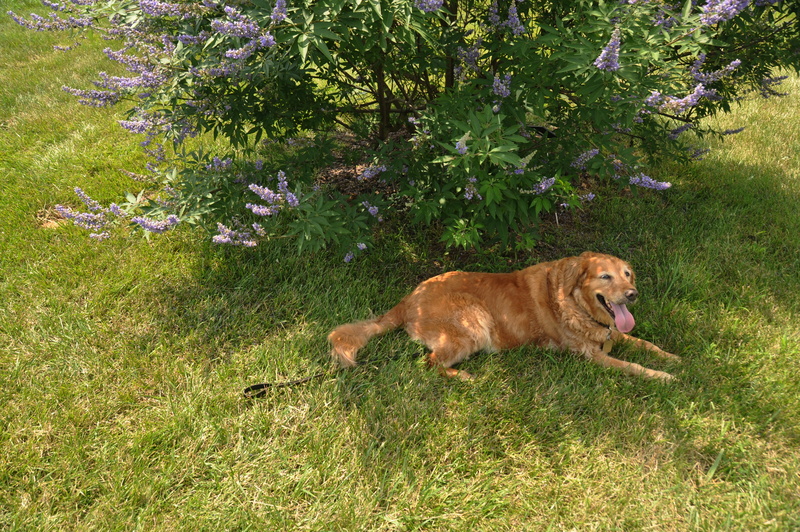 Alas, though, we arrived in one piece at the Quality Inn in Bowling Green, where the first thing I noticed was a “No Pets” sign on the door – this despite me having called the hotel two days prior and confirming that pets were allowed. It was explained by the hotel manager that the original Quality Inn, located across town before it changed owners, was pet-friendly, and that booking agencies such as expedia.com hadn’t updated their information correctly. I still flinched, seeing as I made my reservation directly through the hotel’s web page, but ultimately they agreed when they saw that Molly was little more than a spoiled, 70-pound furbaby, about as harmless as a Democratic Senate candidate in the Deep South. Crisis averted. I have found that with age, I can still out-hike and sight-see people half my age. That being said, the transit aspect of travel wears me out much quicker than it once did. As such, I was knackered from the drive, and called it an early night. They headed off for Cave City, 15 miles to the north, for gem mining and souvenir shopping, while I embarked for Mammoth Cave itself. Like most national parks, the drive from the park entrance to the visitor center was several miles in length, and wound through pristine forest that was a verdant green from a rainier spring and summer than normal. 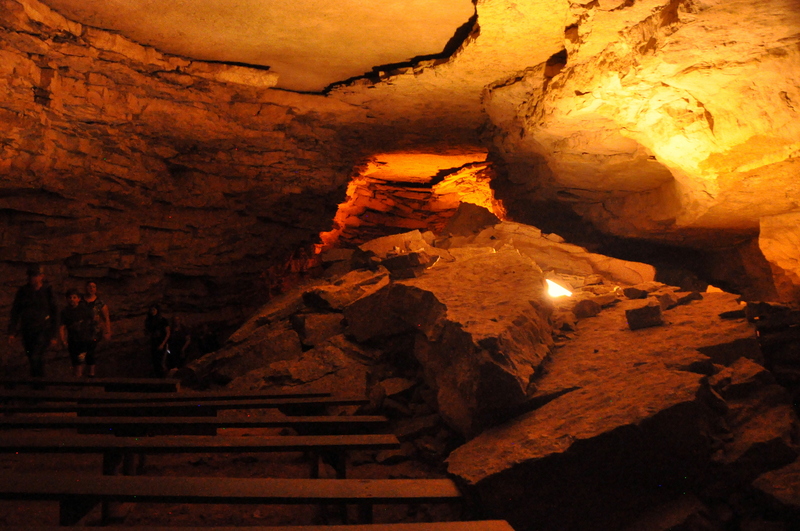 The highlight of this portion of the cave tour was when the ranger told us that he would turn off the lights for 30 seconds so that we could imagine what it was like for early explorers once they extinguished their lanterns. Eerie! The ranger asked us to be quiet for 15 seconds so that we could really take in the full experience. Not without a sense of humor, I was about to make a fart noise with my mouth until someone else beat me to it! With so little precipitation in this section of the cave, there weren’t many of the usual stalactites, stalagmites, cave popcorn, and other such formations on display. While the tour was a bit disappointing in that regard, it also was a informative geology lesson on the millenia-long evolution of such a place. 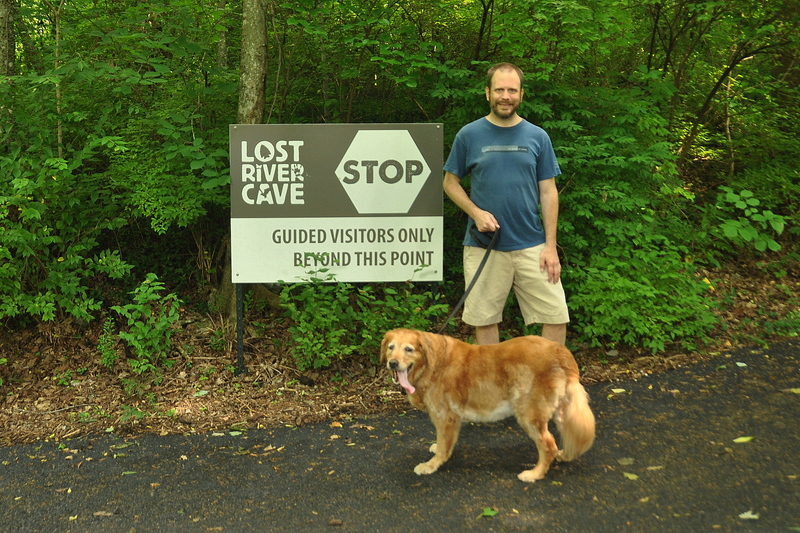 And with some 400 miles of mapped passages and what is estimated to be several hundred more unmapped ones, I couldn’t help but think that Mammoth Cave predates even the dinosaurs. The final third of the tour, better known as the “Frozen Niagara” section, better resembles a traditional cave in terms of low ceilings, precipitation, and the usual dripstone growths. Frozen Niagara itself, an optional add-on, is a rippled, ever-changing wall, perhaps 70 feet in height, that indeed resembles a waterfall cascade. 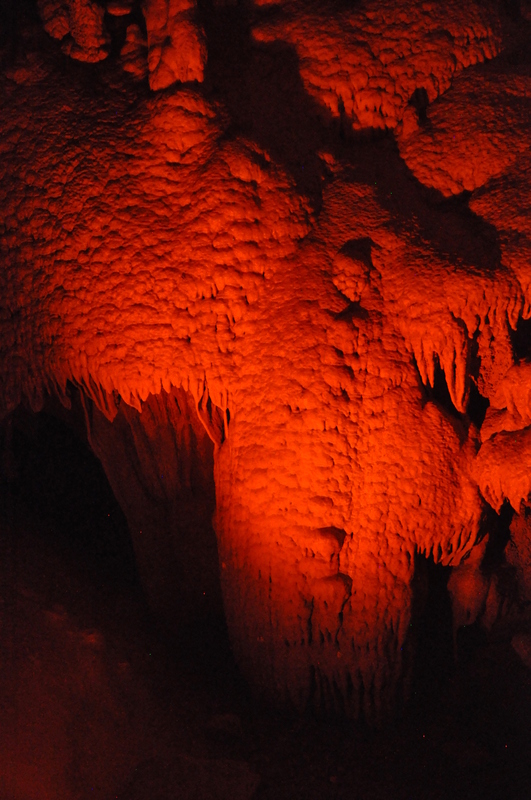 A shorter, and cheaper, cave tour, bypasses the drier, earlier sections and focuses just on this remarkable formation, and may be an option for visitors short on time. With two tour groups arriving at Frozen Niagara at once, I felt overly pressured to take rushed photographs, though with a high ISO and a steady hand I suppose I could’ve done worse. What do you think? Fun fact for my arachnophobe friends: the final passageway to the exist passed hundreds of cricket spiders. As we emerged into the open air at the end of the tour, my camera lens fogged up immediately, and it clearly had rained while we were underground. I was hoping to check out some of the hiking trails near the visitor center, and I suspected that it was going to be muddy going. Lunch at Spelunkers Cafe, the malt shop on site, was a dismal affair. I could have opted for the adjacent Green River Grill restaurant instead and gotten a better meal, though I felt a tad underdressed with my windbreaker, pasty white legs, and muddy sneakers. Still, as is generally the case in national parks across the country, public-facing park concessionaires offer excellent customer service, so I can’t blame an amiable cashier for a crummy cheeseburger that she surely didn’t cook herself. 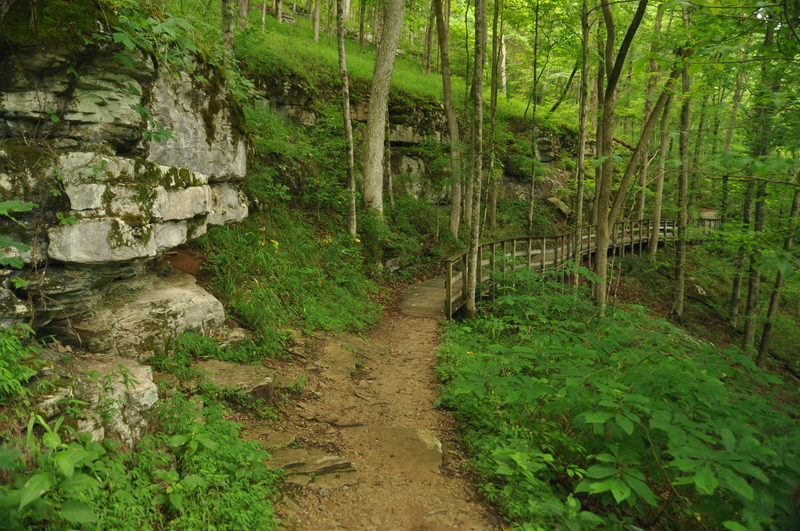 A trail close to hear passes Dixon Cave, which is not connected to Mammoth Cave itself. 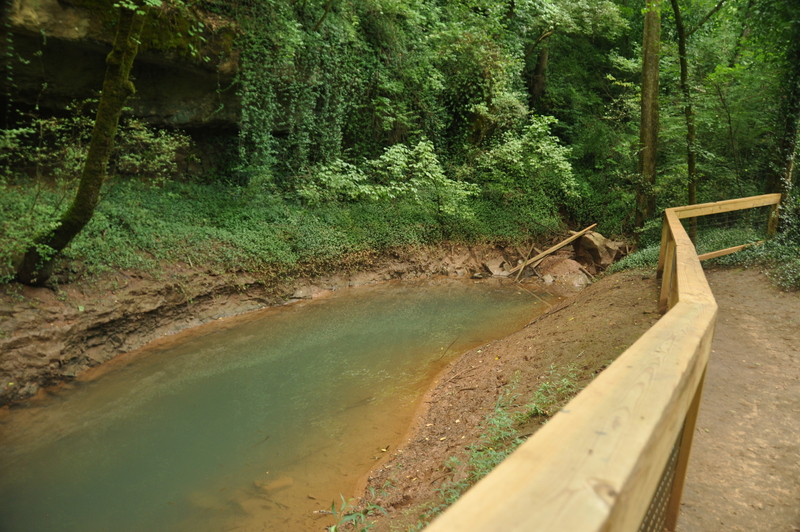 Access to Dixon Cave was fenced off as it is now a sanctuary for bats. I followed the trail down to the river’s edge itself (muddy!) 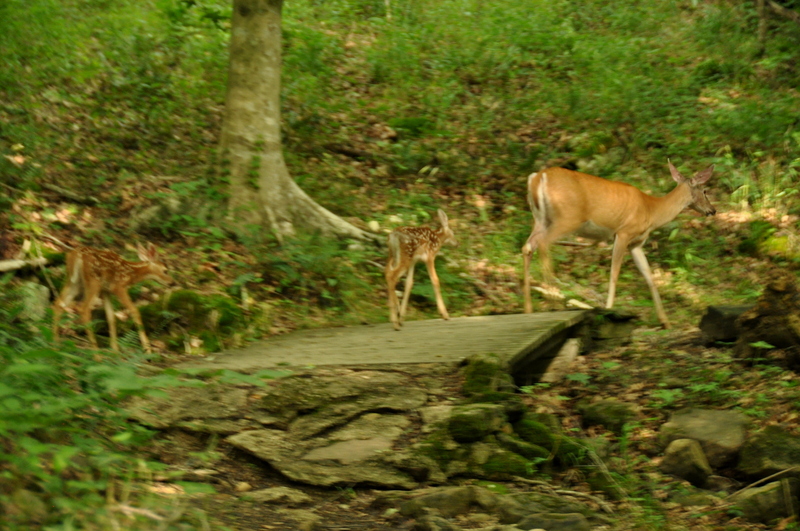 and hiked closely behind a family of deer that appeared to be taking the same route. They didn’t seem too bothered by my presence, though I did keep my distance, my camera’s zoom lens overcompensating. This encounter was the highlight of my day, and perhaps of the entire weekend. I find that time passes quickly whenever I am enjoying nature, and I didn’t leave the park until sunset (spotting no fewer than five adult deer in the visitor center parking lot). I arrived at the hotel to find that Molly and the other womenfolk in our party had called it an early night. As it happens, Molly still hadn’t touched her food, although I’m told she wolfed down a quesadilla that my sister brought back from the Mexican restaurant next door. There isn’t much to write about the next day. We spent the entire day at Beech Bend, a combination amusement park/water park on the outskirts of Bowling Green. We arrived before the park opened at 10 a.m. and stayed until roughly 6 p.m., giving us ample time to enjoy the lazy river, water slides, Kentucky Rumbler roller coaster, and old school carnival rides like the Gravitron. The rain held off and it was time and money well spent. The last day, a Sunday, found us visiting a different cave system. 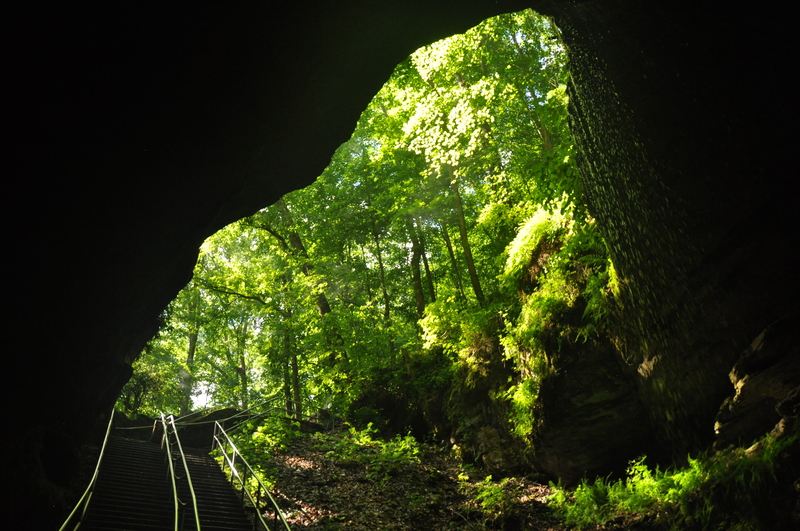 Lost River Cave, in southwest Bowling Green, is hidden below street level and accessible only by boat. The karst cave was once used as a hideout for Prohibition-era moonshiners and wild west train robbers, and along the access road to the boat launch you’ll see kitschy placards about Jesse James and others, the content of which is half-truth and half-exaggeration. 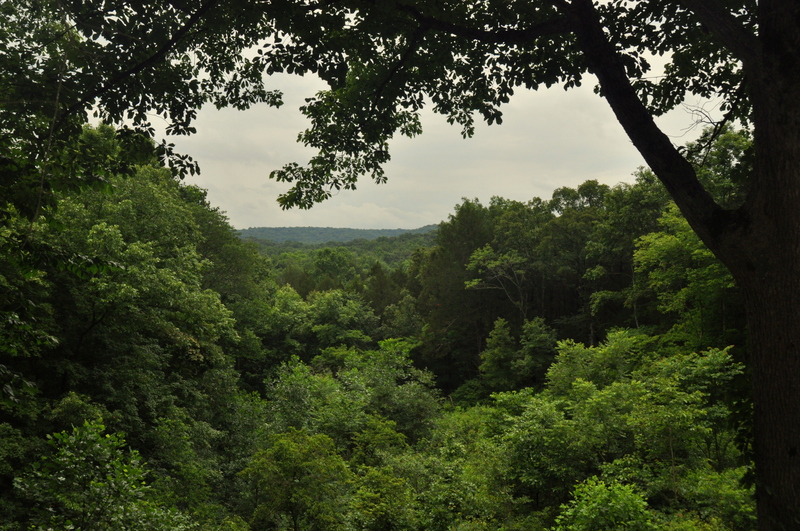 Access to the site’s hiking trails and butterfly aviary is free; gem mining, ziplining, and cave tours cost extra. 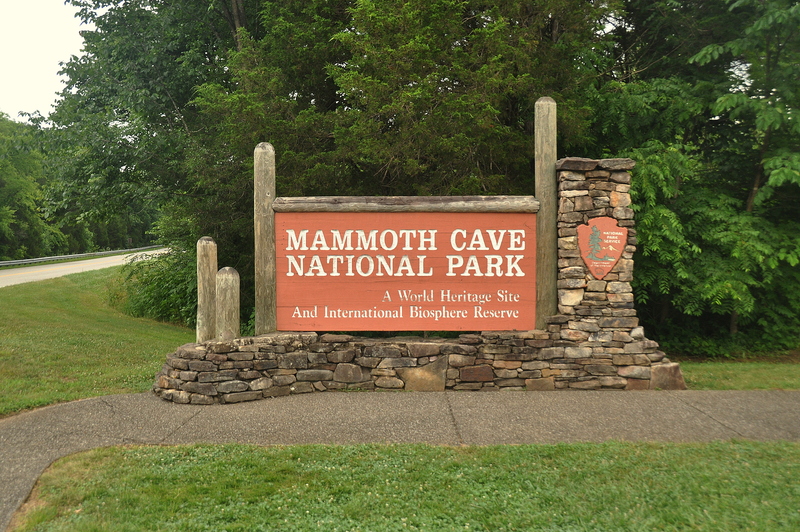 The boat ride through the cave is just 30 minutes in length (and you simply must duck your head at a couple of points), but it is an interesting complement to the much larger, drier Mammoth Cave. My sister, who had done the tour before, waited behind with Molly; at tour’s end she and her daughters headed to their home in Memphis while I explored the shady trails with Molly. A series of sedentary, blue, marsh-like lagoons appeared on either side of the trail, fenced off from public access, and Molly decided that a small spring further along the trail made a great spot for an impromptu nap. I was caved out, so to speak, but after three days I still hadn’t seen much of Bowling Green itself. I spent the next few hours simply driving around, stopping off at a few planned detours (the National Corvette Museum) and a few unexpected ones as well (the Fruit of the Loom Headquarters). 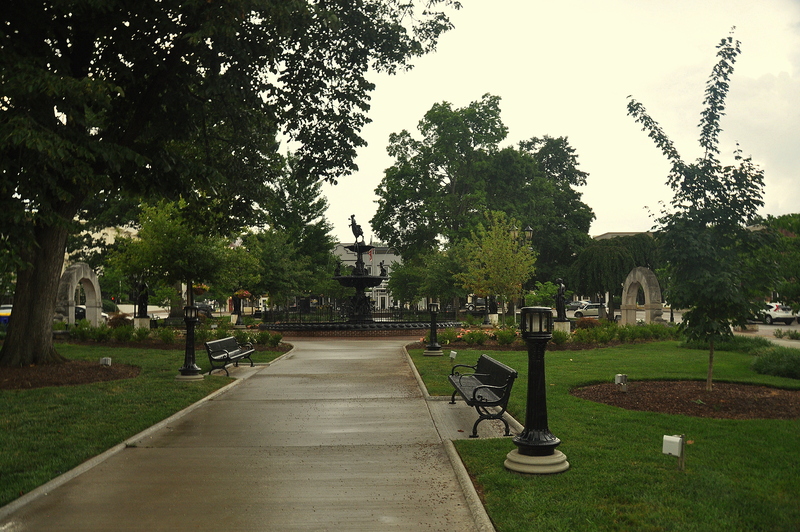 The rain started not long after I passed the campus of Western Kentucky University (home of the Wildcats of NCAA Basketball renown), and I my spent hour in town simply walking around downtown Bowling Green in the rain. I parked near Circus Square Park, with its historic Standard Oil Station from 1921, and strolled several blocks west to Fountain Square Park, which was surrounded by a square block of low-rise, Beaux Arts buildings. It really was too bad about the rain – except for a few kids splashing in the fountain at Circus Square Park, there wasn’t a soul around. This beautiful downtown deserved better. It is worth noting that after four days of excitement, Molly still hadn’t eaten her food. I made a final stop before heading home: White Castle, of which there are none in Tennessee and at which I hadn’t eaten since my teens. It was absolutely terrible, one of the worst meals of my life…and it should come as no surprise that Molly was more than willing to eat whatever I couldn’t finish, with a lick of her chops and a doe-eyed plead afterwards for more. She cowered in the backseat when a thunderstorm punctuated the middle section our journey home, and once she was back at home, in familiar territory, she wolfed down a bowl of kibble like all was once again right with the world.